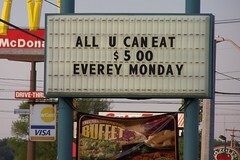 This sign at the local Mr. Gatti's Pizza has been up for at least a week. I don't know which is worse, that no one in management has caught the spelling error, or that no one from the public has. I first noticed it last week and waited for it to be corrected. When I saw that it was still up, I decided it was time to get out the digi and snap a shot. How sad that we are also a nation of bad spellers.